I was on my way home from teaching at the Conferencia de Damas (Spanish ladies' conference in Mexico), and it didn’t bother me a bit to be extremely early to the airport. I have only missed one international flight in all my years of flying, and once was enough to convince me that “too early” is always better than too close! Since I had some extra time, I went searching for a place to get a manicure. I don't get manicures often, but I was in the mood to have my ragged-looking hands repaired. After asking around, I was pointed in the direction of a place that said “massage” in Spanish. All the technicians were busy giving massages, and I was told that they could get to me in about 30-40 minutes. I had plenty of time, but I didn’t want to spend it waiting for one of their massage therapists doubling as manicurists. I thanked the receptionist and headed for the Sky Club, planning to spend the rest of my time writing. It was a divine detour. Scanning the room, I saw a salon. "Maybe I'll get to have a manicure after all," I thought as I walked towards the room marked "spa." Sure enough, they had someone available to do my nails. Her name was Magali, and she was very quiet and polite. I knew right away that this was going to be more than a manicure. "How old are you?" I asked, guessing she was a teen. "No," she said with an apologetic smile. My head was tired from teaching five times in Spanish at the ladies' conference. Unless you speak more than one language, it's difficult to comprehend how much it takes to teach in a language that is not your own. I wanted to remain silent for the rest of the manicure, but when this young lady asked me where I was from, I knew that her question would most likely lead to her asking me why I was in Mexico. From there, it would be a short walk to the Gospel, so it was time to get over being tired and get back to serving. Magali listened with deep interest, looking up from the manicure with intensity in her eyes as I shared the truth of Scripture with her to the best of my limited ability in Spanish. I was using my English Bible (my Spanish Bible was in my checked luggage), translating the verses for her as we walked down the "Romans Road." 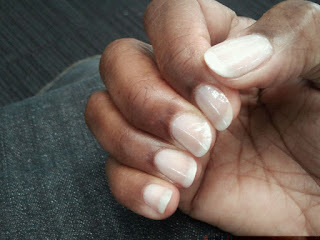 By the time my nails were in the drying process, she was ready to pray and trust Christ as her Savior. 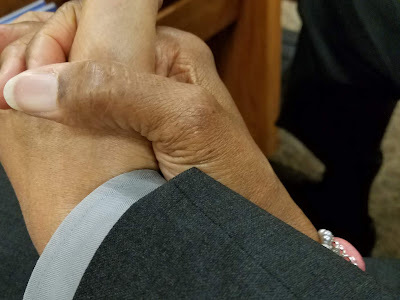 She bowed her head at the manicure table, and we prayed together as I stumbled over the words in Spanish (she was even correcting my grammar as we prayed)! Did she really get saved? God knows, but I do know that there are godly, caring Christians in Mexico who will help this young lady either way. Everybody loves a happy ending to a soul winning story, but the truth is that only God knows when a soul trusts Christ. Over time we can often tell as we see marks of spiritual growth, but initially, we only know that we have completed our side of the transaction: to tell others that Jesus has a free gift waiting for anyone who will receive it. I recommended that Magali get the support of a good church, and she gladly gave me her phone numbers to pass along to the Pastor's wife, Rosie Ramirez at Monte Abarim Baptist Church in Cuernavaca, Mexico. If this young lady truly is a baby Christian, she will be in good hands. If she didn't quite understand, she will be given an opportunity to hear the Gospel again. God knows what He is doing. I miss out on more soul winning opportunities than I even realize. There are times when I won't talk to the seat mate on a flight, or I suddenly become shy (yes, on rare occasion), or I struggle with doubts about whether or not the person wants me to bother them. In other words, I'm a big chief human selfish sinner. But thank the Lord for those times when humility wins over pride, and I set aside how I feel or what I think and just give out the Gospel. Do you need to witness to someone? Die to self. Live for Christ. Share the Good News with abandon. Somebody did it for us.